missioner since 1906, his present term expiring in 1912. He is well and favorably known, and is a member of the Knights of Columbus of Creighton. After the memorable blizzard of April 12, 13 and 14, 1873, Mr. Dedlow, who was working for Herman Mavis, near Pierce, caught prairie chickens with his hands, their eyes being closed with snow and ice. Several Indians laid in a straw stack near for two or three days. 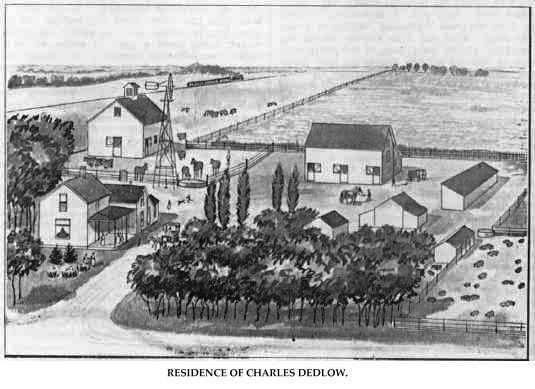 Mr. Dedlow lost crops in 1874, 1875 and 1876 by grasshoppers. Just before the blizzard of January 12, 1888, he had turned the cattle out. He went after them, drove them to shelter, and found his way back to the house, a feat accomplished by few. In reviewing the history of Pierce county, Nebraska, the citizens who have contributed to her welfare must be given special mention, and a prominent place is accorded the gentleman above named. Mr. Knaak is a pioneer settler, coming here with his parents in 1880, and is one of the best known and most highly respected men in his region. He is a prosperous agriculturist and has built up a comfortable home and fine farm near Foster, where he enjoys a peaceful and contented life. Mr. Knaak was born in the village of Naugard, province of Pommerania, Germany, May 19, 1868, and is the son of Fred and Augusta (Rehfeld) Knaak, both natives of Germany, where the father followed the occupation of farmer. His elder son, Herman Knaak, served in the German army from 1876 to 1880. On coming to America, the family sailed on the steamship "Herder," and, after landing in the United States, came to Pierce county, Nebraska, where the father homesteaded land in section fourteen, township twenty-seven, range four. Here they lived in a sod house six years, when the father took up a timber claim in section twenty-two, township twenty-seven, range four, and planted ten acres to trees. Our subject received his education in the district schools of Pierce county, and grew up to his young manhood on the farm. On March 29, 1894, he was united in marriage to Miss Lizzie Kieckhefer, also a native of the village of Naugard, who came to this country in 1881 with her parents, who took up a homestead in Pierce county, Nebraska, in section six, township twenty-seven, range three. Her father, Henry Kieckhefer, and brother, Robert, were lost in the blizzard of January 12, 1888, when they started after the cattle, and, drifting with the storm, were frozen before they could find shelter. Their bodies lay on the prairies from Thursday night until Sunday, when searching parties found them in the snow. In religious faith Mr. Knaak, with his wife, is a member of the German Lutheran church, and is a democrat, always voting that ticket. His home is on section five, township twenty-six, range three, where he has a good dwelling and farm buildings, and enjoys the respect and good will of all who know him. Henry Roe, deceased, for many years prior to his death, was known as a prosperous farmer and worthy citizen. He became one of the pioneer settlers of Howard county, and his farm in Warsaw precinct is one of the valuable estates in that locality. During the last few years of his life, he made St. Paul his home, retired from active labors, and his wife and children now occupy the residence there. Mr. Roe died, February 11, 1908. Mr. Roe was born in Pilbery county, Ireland,. on June 28, 1834. In 1850, he emigrated to Canada with his parents and seven brothers and sisters. He soon afterwards settled in Huron county, Ontario, beginning work on his own account, following farming for a number of years. He was married there to Mary Duke, and to them were born three children, the wife and mother dying four years after her marriage to our subject. Their son, David, is now living in Howard county, and is the father of thirteen children. In 1863, Mr. Roe was married the second time, to Mary A. McCracken, in Canada. Mrs. Roe was a native of that country, the eldest in a family of eight, and she became the mother of seven children, five born in Canada. In 1872, the family came to Nebraska, locating in Howard county, where Mr. Roe preempted one hundred and sixty acres, and lived on it for six months, then homesteaded on section fourteen, township fourteen, range eleven. This he proved up on, and later purchased railroad land in the same vicinity, and by dint of industry and thrift, succeeded in becoming a prosperous farmer and stockman. He went through many disappointments and hardships in getting started, but always stood for the best interests of his county and state, and his name will occupy an important place in the history of the region. Mr. Roe was a republican, and was prominent in his party. During the early years, he served as justice of the peace, also was moderator of his school district for a number of years. are living with her. She is a very estimable lady, enjoys the friendship of a large circle of people, and is surrounded by her children who are a source of comfort to her, they all being settled in nice homes of their own within a radius of thirty miles of St. Paul. John L. Ward, a Nebraskan, born and bred, is a typical westerner. He is an intelligent and progressive citizen of Valley county, and classed among the successful farmers of this locality. He is a young man of firm characteristics, and his high standing as a worthy citizen is well merited. Mr. Ward was born in Valley county, Nebraska, November 21, 1882, a son of Asahel and Amanda (Honnold) Ward. He is youngest of three children, and has a sister residing in Howard county, Nebraska, and another living in Ord, where the parents are also living at the present time. Our subject received his education in the local schools, graduating in 1904 from Ord high school. On August 15, 1909, Mr. Ward was united in marriage to Miss Dora Milligan, who is also a native born Nebraskan. They have one daughter, Alice. Mrs. Ward's parents, Mr. and Mrs. Ed. Milligan, reside in Valley county, together with six other daughters and seven sons. Mr. and Mrs. Ward have made their home in Ord since January 1, 1911, and they have a tract of eighty acres in Garfield county. Mr. Ward is still a young man, interested in all pertaining to the welfare of his home state and county. He is held in high esteem in his community and has served as justice of the peace for two years, filling that office creditably to himself and satisfactorily to the people. Mr. Ward is now in business as a landscape photographer. He is district deputy of the Tribe of Ben Hur, a member of the Modern Woodmen of America and Royal Neighbors of America, and is, with his wife, a member of the Ladies of the Grand Army of the Republic. To the men of perseverance and stalwart determination, who emigrated west many years ago, and particularly those settling in the state of Nebraska when it was yet undeveloped as an agricultural or commercial region, practically all the prosperity there is due. Prominent among the pioneers of Madison county, and one who has been intimately identified with its growth and progress, incidentally gaining also an enviable reputation as a worthy citizen, may be mentioned E. C. Broberg, now a prosperous and successful farmer, proprietor of the estate known as the Hopefield Farm, in section eighteen, township twenty-one, range three. Mr. Broberg is a native of Sweden, born in Skona, on January 3, 1871. He is a son of N. M. and E. L. Broberg, all the family coming to the United States in 1880. Their first stop was made at Chicago, Illinois, where they remained for six years, our subject working as a clerk. He then came on to Nebraska, locating in Madison county, where he purchased the Cooper homestead of James Stuart. He added many improvements to this property, engaged in the grain and stockraising business, and eventually built up a very fine farm of the place. In 1908, he erected a comfortable and handsome dwelling, also other substantial outbuildings, fences, etc., and is now the owner of one of the most valuable estates in the township, his farm consisting of one hundred acres of fine farming land. Mr. Broberg makes a specialty of raising thoroughbred Duroc-Jersey hogs, of which he has about one hundred head. Mr. Broberg was married at Elgin, January 19, 1896, to Miss A. Swanson, who lived in Elgin. Mr. and Mrs. Broberg have four children, named as follows: Alfred, Walter, Lloyd and Gladys, all bright and sturdy youngsters. Since locating in Madison county, Mr. Broberg has taken a deep interest in affairs of his community, and has in every way possible assisted in promoting its welfare. Anton P. Dobesh, one of the most widely-known men of Custer county, Nebraska, belongs to a representative family, and one that is highly respected wherever known. He is a man of business ability and energy, being progressive in his ideas, and actively interested in all measures calculated to advance the general welfare and prosperity. He was born in the village of Rouchovany, Moravia, a part of Bohemia, January 13, 1861, next to the eldest of thirteen children born to Tomas and Josephine (Job) Dobesh. The parents were born, reared and married in Moravia, and came to the United States in the spring of 1871, sailing from Bremen to Baltimore, in the "Columbia" it is believed, and spent nineteen days on the water. With their six children, they first, located on a homestead in Saunders county, Nebraska, which the father secured, and there several children were born. There were, in all, seven sons and six daughters in the family. One daughter, Annie, now Mrs. Pelan, lives on the old home farm, two sons and one daughter live in Custer county, and one son and two daughters live in Butler county, Nebraska. The mother of these children died in Saunders county in 1884, and the father, now in his eighty-fourth year, has retired from farm life, and resides in Weston, Saunders county. He is highly respected as an upright and reliable citizen, and has a large number of friends. Anton P. Dobesh accompanied his parents to America when he was about ten years of age, and as a youth helped with the work on the farm in Saunders county, receiving a common-school education. In the spring of 1879, he came up into Custer county for the purpose of looking the country over, thinking to locate there. In due time he took up a homestead and timber claim on section eighteen, township fourteen, range eighteen, his nearest neighbor being four miles distant, and his nearest trading point Kearney. He is one of the few original homesteaders to retain possession of his original farm throughout the years up to the present time, and has been closely identified with the progress and development of the region.. He has made a specialty of stock-raising, and ships several carloads of cattle to market each year. He is a self-made man, and has passed through the various periods of hardship and privation that have been the lot of the old settlers in Custer county, developing his land into a fine stock and grain farm, which is well equipped and improved. He makes a specialty of Durham-bred cattle, and during the last few years has raised a large amount of grain. He owns two thousand acres of rich farming land, and is one of the most successful men of central Nebraska. Mr. Dobesh married in Saunders county, March 19, 1882, Mary Tomsicek, daughter of Joseph and Mary (Novacek) Tomsicek, who came to America in the spring of 1878, sailing from Bremen to Baltimore. Mr. and Mrs. Dobesh have five living children: Anton K., who is married, and lives in Custer county, has two children; Frank, Josephine, Tomas and Mary, all at home. These children were all born on the homestead, and attended local schools. Mr. Dobesh was reared in the Catholic faith, and is a member of the Ancient Order of United Workmen. In politics he is a staunch republican, and at one time was one of the only two members of his party in the precinct. The hard times of the early nineties bore severely on the settlers, several years of drouth or hail succeeding each other with little intermission. In 1894, Mr. Dobesh harvested but a little fodder, and two years later lost everything by hail. Kearney was their nearest market in the early years of settlement here, the trip there and back requiring three or four days' travel. Deer and antelope were to be seen on the prairies in great numbers, but soon disappeared. Dr. Thomas M. Thomson, one of the best known and most successful dentists of Howard county, Nebraska, has his home office in Dannebrog, where he has been established for the past several years. Mr. Thomson was born in Denmark on December 3, 1872. He received his education in his native country, obtaining his diploma as a doctor of dentistry from one of the celebrated colleges there, and also qualified as a registered pharmacist. In 1899, Mr. Thomson came to America with the intention of making this country his permanent residence, and picked out Nebraska as his location, going at first to Lincoln. There he entered the office of a well-known practitioner as assistant dentist, remaining for one year, then passed the examination required before the state board, and came to Dannebrog. On September 25, 1901, our subject was united in marriage to Johanna C. Mortensen, of Dannebrog, and they made this their home up to 1904, at which time they went to Chicago, Illinois, Mrs. Thomson entering the dental department of the University of Illinois, from which she graduated in 1907. During this period, Mr. Thomson held the position of bookkeeper for a large Chicago house and immediately after his wife had completed her studies, they returned to Dannebrog, and opened an office, and have since followed their profession in partnership, now enjoying a large and lucrative practice. Prior to her marriage, Mrs. Thomson was a teacher in the public schools of Nebraska, and for some time taught in the government Indian schools at Genoa, Nebraska. They have built and furnished one of the handsomest homes in the city, in which they live, and enjoy the friendship and esteem of all with whom they come in contact in a business or social way. George A. Clark is one of the oldest settler's in Merrick county and vicinity, and for many years has been one of the leading and prosperous agriculturists of this section. He came here during the early days of its settlement, and has become closely identified with the best interests of the community, where he has passed so many years of his career. Mr. Clark is a son of Benjamin and Maria (Baxter) Clark, was born in Rochester, New York state, July 24, 1840, and was second of ten children, two brothers of whom, Oliver W. and William M., live in Central City, and the others being deceased, as are also the parents. In infancy Mr. Clark went with his people to Pennsylvania, living there until 1844, when the family moved to Illinois, where they followed farming. he participated in recovering the retreat of General McClelland at Harrison's Landing, and was also in siege of Charleston, South Carolina. After a furlough, he re-enlisted, and went into Virginia, and was at Drury's Bluff under General Butler; he was at Richmond and Petersburg, and participated in the charge on Fort Gregg, and witnessed Lee's surrender. He participated in the grand review before Lincoln at Fredericksburg, Virginia, and after the war he returned to Illinois, engaging in farming and the mercantile business. On October 31, 1867, Mr. Clark was united in marriage to Miss Florence A. Strickler, of Illinois. Mr. and Mrs. Clark have had two children born to them: Carroll E., married, has two children, and resides in Central City, Nebraska; and Lela B., wife of G. A. Rose, has six children, and also lives in Central City. In April, 1871, Mr. Clark came to Merrick county, Nebraska, where he homesteaded one hundred and sixty acres in section eight, township fourteen, range six, which remained the home place until 1893, when he retired from the farm, moved into Central City, and purchased a good home, where they now reside. In 1903, Mr. Clark engaged in the hardware business, which he sold three years later. Mr. Clark has been active in the upbuilding of his community, and in the early days helped to organize school district number eighteen, and served as director of same a number of years. He has also served on the city school board for six years. Mr. and Mrs. Clark have passed through all the trying experiences and hardships incidental to pioneer life. They have been prosperous and successful, and are widely and favorably known. One of northeastern Nebraska's most successful merchants, Bert Y. High, has been a resident of the state since 1876. He is a native of Pennsylvania, born at Reading, March 2, 1858. His parents, Reuben and Esther (Yoder) High, were both of old Pennsylvania families. The great grandfather was a Hessian, and settled in the Keystone state probably after the Revolutionary war. Mr. High was reared in Reading until eighteen years of age, when he came west to benefit his health, his family fearing tuberculosis. It was his intention to remain in the west only a short time, but the climate and the people and western institutions were too strong a lure for him. He did not return for even a visit until after five years, and never has he desired to return to remain [sic]. Reaching Omaha, August 1, 1876, he remained a few days at the old Canfield House - later the Bailey - opposite Union Pacific headquarters, and then went to West Point, and was employed in farm work until spring. Joining a wagon train to the Black Hills, he enjoyed life in the open for the rest of the season. There being but a few wagons in their party, not enough to go through the Indian country alone, they joined others they found in camp, near where Valentine now stands, waiting for recruits. Several more wagons coming on from the east in a few days making a train of twelve to fourteen wagons, enough to cope with hostile bands. There were five or six in the party starting from West Point, and their wagon being heavily loaded, only one was allowed to ride and drive, all taking turns at walking. Their team consisted of four yoke of oxen, and as the progress was slow, they were about forty days on the way to Deadwood, where they remained two or three months. Though there were but two teams of them, they returned by way of the old trail to Sidney, passing through the country of roving bands of Indians, who, fortunately, did them no violence. From Sidney they descended the Lodgepole creek to the Platte river, which they followed down to the city of North Platte, where they sold their outfit, and returned to West Point by rail. Shortly afterward, Mr. High secured a clerkship in a store in Columbus, and remained for two years, becoming familiar with merchandising, which was to be his life work. In 1879, he came to Knox county, and secured employment in the store of H. E. Bonesteel at Niobrara, remaining with the establishment, of which he later became manager, for twenty-four years. In 1903, having saved enough to go into business for himself, Mr. High came to Bloomfield, and opened a general store - dry goods, groceries and hardware - in which he has made a signal success. His genial disposition has made him agreeable alike to salesmen and customers, and whether one desires to buy or sell, he meets with the same cordial courtesy. Mr. High was first married in Niobrara, Nebraska, in 1881, to Miss Mary Diez, who was born in Germany, whence her father, Winzel Diez, emigrated to the states, and settled in Knox county, Nebraska. Two children were born to them: Lottie, wife of William McLaren, of Lincoln, and Ralph, associated with his father in the store. The first Mrs. High died in 1892. He was married a second time in Creighton, to Miss Irene Henderson, a daughter of Walter Henderson, born in Princeton, Illinois. Mr. Henderson, now deceased, was for a number of years county attorney of Knox county. Of this second marriage, one daughter was born: Alice. Mr. High is a democrat in political views. He is high up in Masonic circles, holding membership in the blue lodge, chapter council and commandery at Bloomfield. He is also a member of the subordinate lodge of the Independent Order of Odd Fellows. Mr. High was witness to the devastation wrought by the grasshoppers in 1876 and 1877, making it hard to secure his pay for work done on the farm near West Point. He located in Niobrara prior to the great flood, and was present when the old town was moved to the new site, on higher ground. Although the water rose to nearly the height of the counters in the store, Mr. High and others remained at their posts. He has witnessed the development of Knox county from an open country to a fenced and highly cultivated farming region. In the early days, a journey from one point to another could be made in nearly a straight line. Mr. High has traveled as far west as the Pacific coast, going to Portland at the time of the exposition there, visiting Salt Lake, Denver and other western towns on the trip. None with the same opportunities has made a greater success than Mr. High. He knows the business of merchandising to its smallest details, and knows the art of selling and buying equally well. He speaks Indian, the Sioux tongue, fluently, and enjoys a large trade with the aboriginee, as well as with the later comers to Nebraska soil. For more than thirty years the above-named gentleman has been closely identified with the growth and development of Stanton county, Nebraska, and is well known as a prosperous farmer and good citizen, His estate is located very pleasantly in section two, township twenty-two, range three, east, and is in every way a well-improved piece of land. Mr. Tiedtke was born in Prussia, Germany, in 1846, and is the son of Matthew and Carrie Tiedtke. The father was a small farmer, and our subscriber remained at home, helping his parents, until he was considerably past his majority. In 1872, he left his native land for America, coming over on a slow-sailing vessel, as was the custom, and coming to New Jersey. Immediately after landing in New York City, he remained in this state for over a year. He then went to Michigan, and stayed there for three years. From Michigan, Mr. Tiedtke came direct to Stanton county, Nebraska, in 1877, one of the years when the grasshoppers proved to be such a menace to the farmers. He came to Fremont first, and from there started to walk to hunt work. He hunted for work for four weeks before he finally "landed" the elusive job, by which time he had become foot-sore and weary indeed. He worked for a time, and then bought eighty acres of fine land, which formed the nucleus of the immense estate, of which he is now proprietor. By dint of hard work, and by the exercise of considerable thrift and good management, he succeeded in improving the original eighty, and also from time to time was enabled to add adjoining lands, until now he is the owner of more than five hundred acres of as fine farming land as one would wish to see. In 1880, Mr. Tiedtke was united in marriage with Gusta Sasse, and later on, in 1896, some time after the death of his first wife, he was married to Miss Amelia Corneak. Five children have been born to him: Otto, Hattie and Ida, of his first family, and Edward and Arthur, of the second marriage. W. H. Cormeny, one of the best known residents of Antelope county, Nebraska, has spent, many years of his life in the pursuit of farming and has met with pronounced success in his chosen work, and owns a fine farm in the northeast quarter of section ten, township twenty-four, range seven. He has resided there during the past thirty-two years, and is classed among the prominent old settlers of that region. Mr. Cormeny is a worthy citizen and a good neighbor, and richly deserves all the success which has come to him. Mr. Cormeny was born in 1853, in Lancaster county, Pennsylvania, the home of ex-President James Buchanan, where our subject's father, Samuel, ran a hotel, for thirty years. Mr. Cormeny is the son of Samuel and Margaret (Stewart) Cormeny, the father being a native of New York state, and the mother a native of Pennsylvania. His grandfather was a native of Germany. Our subject's oldest brother, G. W., served in the Civil war, enlisting in the One Hundred and Twenty-second Pennsylvania Regiment, and participated in several battles all through the south. In 1872, Mr. Cormeny came west, where opportunities were greater, and settled in Omaha, where he remained six years. While in Omaha, he was employed as a printer in the office of the "Morning Herald," and later in the office of the "Bee." He then bought a team, and drove to Antelope county, Nebraska, where he took up the homestead he now lives on, which is in northeast quarter, section ten, township twenty-four, range seven, and known as the Pleasant Grove Farm. Mr. Cormeny first built a sod house on this land, which he lived in, and "batched" it for six years. July 4, 1888, Mr. Cormeny was united in marriage to Miss Florence Simmons. Mr. and Mrs. Cormeny are the parents of a family of three children, whose names are as follows: Alice, married to John Udey, and has one child; Cora, wife of Mr. E. Curtright, and daughter, May. Mr. and Mrs. Cormeny and family enjoy the respect and esteem of all who know them, and their friends are many. always taken an active part in public affairs, and has served his constituents and fellow townspeople faithfully and well in the different capacities of county supervisor of the seventh district for four years, has held every township office, and at the present writing is serving as township clerk. The Kaelin family has long been held in high esteem in Custer county, and Burkhardt Kaelin, whose name heads this sketch, is a self-made man, who began life on his own account in early youth. He was born in Switzerland, April 26, 1865, the eldest child of Joseph and Mary Kaelin, who had two sons and three daughters. The father and mother, with their three children - Burkhardt, George and Lizzie - came to America in the spring of 1872, sailing from Havre, France, and first located in New York City, where the father was employed as a finisher and adjuster of the assembled machines by the Singer Manufacturing Company. They then moved to New Jersey, where they spent a few years, and in 1877 removed to Jo Daviess county, Illinois, locating two miles east of Elizabeth, where the father engaged in carpentry. In September, 1886, Burkhardt Kaelin came from Illinois to Custer county, Nebraska. He had worked at farming since his thirteenth year, and, upon coming west, took up a homestead on the east half of the southeast quarter of section one, township fifteen, range eighteen, of Custer county. In 1892, he purchased a farm in section eleven of the same township, and, two years later, moved onto the tract. The home place is located on the northeast quarter of the section. He has three hundred and twenty acres of land in his farm. He has lived on this place since purchasing it, and, with the exception of two years spent in Otoe county, he has been a resident of Custer county since 1886, and is known as one of the younger homesteaders, who have made a permanent home in central Nebraska. He is a progressive and useful citizen, and has made a success of his farming. He has a well-improved and equipped farm, with a large number of cattle and hogs, and raises a large amount of grain. A very complete system of waterworks is one of the notable features of the place. He has a comfortable home, and has many warm friends in his community. He passed through many hardships and trials in his early years there, and has been successful only through perseverance and untiring industry. Mr. Kaelin was married at Ansley, Nebraska, November 20, 1890, to Miss Blanche Reed, daughter of Stephanas and Ann Elizabeth (Morris) Reed. Her father came to Otoe county, Nebraska, about 1867, and was there married in 1869. Mr. and Mrs. Reed live in Syracuse, Nebraska, although they still own their original homestead, which is now operated by a son. Mr. Kaelin and wife have two children, Reed B. and Vera Marie. Mr. Kaelin's father came to Custer county in the spring of 1889, and lives on his farm, three miles north of Ansley. The mother died in January, 1908. Of their children, besides Burkhardt: George lives on section thirty-two, township sixteen, range eighteen; Lizzie (Mrs. Joe Dittmar) lives in Custer county; Sophia (Mrs. John Gouge) lives on her father's place in Custer county; Mary (Mrs. John Lanum) lives on a farm northwest of Ansley. On coming to Custer county to join an uncle, who had preceded him, Mr. Kaelin did not know the railroad had been extended to Broken Bow, so purchased a ticket to Kearney, the supposed nearest point. Of his remaining five dollars, the most was paid for his stage ride to Broken Bow. After paying for his supper and lodging, he had barely enough left for a ticket to Ansley, having to go without breakfast, and reached Ansley with a lone nickel in his pocket. He secured work the first day, making hay in the vicinity, and has never been without money since. At the time of the blizzard of January 12, 1888, Mr. Kaelin was on the way to town, and had just passed his present farm when the storm struck. A bachelor owned the place then, to which he returned, and remained through the night with the hospitable owner, and next day resumed his journey, and returned home. Mr. Kaelin and family lived in sod houses until 1904, their first "soddy" being only ten by twelve feet in size, but big enough for comfort at the time. Mrs. Kaelin, a native of Nebraska, was born in a dugout, but the family, a few months after, moved into a more pretentious dwelling. John S. Wheeler, one of the older residents of Valley county, Nebraska, is well known throughout that section, and is held in high esteem by his associates. He has acquired a valuable property through his industry and thrift, and has always done his full share in the bettering of conditions in his community. Mr. Wheeler resides on section thirteen, township twenty, range fifteen, where he and his family are surrounded in their pleasant home by a host of good friends and acquaintances. 1906. The mother died in 1871. The grandfather, Sylvester Wheeler, attained the age of ninety years, and his father, Amos Wheeler, died at the age of ninety-seven. Mr. Wheeler received his education in his home schools, and later learned the printers' trade in the office of the Register at Liberty, New York. In June of 1878, he came to Valley county, Nebraska, walking the entire distance from Grand Island to St. Paul, where he worked for six weeks. He then came into Valley county, and homesteaded one hundred and sixty acres of land on section twenty-six, township nineteen, range sixteen, which was the home place for twenty-five years. On July 22, 1884, Mr. Wheeler was united in marriage to Miss Ida Wheeler, of the state of New York, where her father, Ferdinand Wheeler, is still living at the venerable age of eighty-seven years. He was a forty-niner, having made the trip to California by way of Cape Horn. After four years, he returned by way of the Isthmus from San Juan to Lake Nicaragua by pack train, and by water to Greytown, whence he sailed for New York, the entire trip consuming twenty-two days. He relates that rosewood and mahogany were used for building purposes as hard woods are used here today. Her mother died, November 2, 1906, she having also lived in New York the entire seventy-eight years of her life. The maternal grandmother, Frasier, came with her parents to Sullivan county from Ireland in 1808, making a home in what was then a wilderness. Ferdinand Wheeler's grandmother, Comstock, attained the great age of one hundred and two years. Mr. and Mrs. Wheeler have had six children, two of whom died in infancy. Those living are: Arthur C., Lloyd F., Ferdinand B. and Merton C., all of whom reside at home. 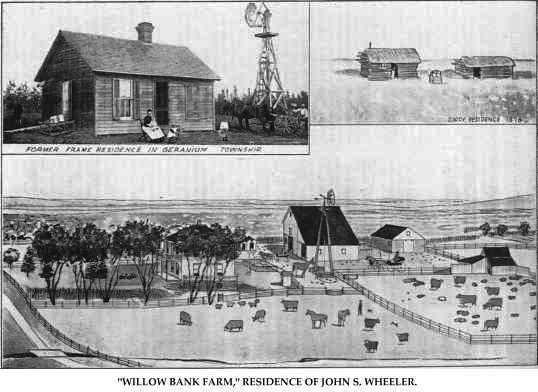 In 1905, Mr. Wheeler purchased one hundred and sixty acres of land on section thirteen, township twenty, range fifteen, which is now the home place, a well-improved stock and grain farm. He has passed through all the discouragements and trying experiences of frontier life, but has never lost faith in Nebraska resources and soil, and has been well repaid for his perseverance and faith. A view of "Willow Bank," the family residence, is shown on another page. For the first five years on his homestead, Mr. Wheeler lived in a "soddy," through the roof of which water dripped for days after a shower. Many a time he slept in a bed soaked with rain. It was in this "soddy" he and a man named Pierson lived the winter of the deep snow, and for six weeks were without flour, subsisting on corn they ground. Nor could they have procured flour had they been able to get to Ord, for the supply there had become exhausted before the roads could be opened and provisions freighted through. For the first few years, he worked during the summer at St. Paul to earn enough to live six months through the winter on his claim. He freighted from the Loup valley to Grand Island, making the trip in a week's time. He was employed in the grading of the railroad between Grand Island and St. Paul, a welcome opportunity to earn enough to sustain him until he could make final proof on his land. At the time of the blizzard of October, 1880, Mr. Wheeler was in the river bottoms, getting wood, and made his way home by leading his team, and feeling his way between the ridges of the road with his foot. His children were at school when the fearful blizzard of January 12, 1888, came on, and in bringing them home he also brought nearly all the other children with him, keeping them over night. In the cyclone of September, 1882, Mr. Wheeler lost his barn and a stack of grain, and in the drouth of 1894, lost all his crops. Deer were plentiful during the early years, sometimes running through the dooryard, and game birds were more plentiful than domestic fowl are now. Mr. Wheeler is a prosperous man of affairs, and has always been interested in all pertaining to the welfare of his home county and state, and has creditably filled several offices. In 1893 and 1894, he served as supervisor for his township, was treasurer of his school district, number thirty-five, for sixteen years, and is now treasurer of school district number sixty-three. He is a populist in political faith, but votes for whom he considers the most reliable man, regardless of party name. He is a member of the Ancient Order of United Workmen at Ord. Christian Lerum, retired farmer of Plainview, Pierce county, Nebraska, and a highly esteemed old settler, first came to this state in 1872, reaching Plainview July 6, previous to which time he had spent some years in Wisconsin. His birth occurred near Bergen, Norway, November 16, 1851. His parents, Christian and Annie Lerum, died when the boy was quite young. In company with an older brother and sister, he emigrated to America in 1860, embarking at Bergen in a sailship, the "Norgen." After a voyage of about five weeks, they landed at Quebec, and came directly west to Dane county, Wisconsin, and shortly after to Buffalo county, Nebraska. Here the boy, Christian, worked at whatever his hands found to do, and as he grew older, secured work on farms, in the lumber woods, and rafting on the river, going as far south as Keokuk. In the spring of 1872, he left Wisconsin for the west, driving through with oxen, and reaching Plainview the sixth of July, after some six or seven weeks on the road. For the first two years he carried the mail between Norfolk and Niobrara, making the round trip once a week.